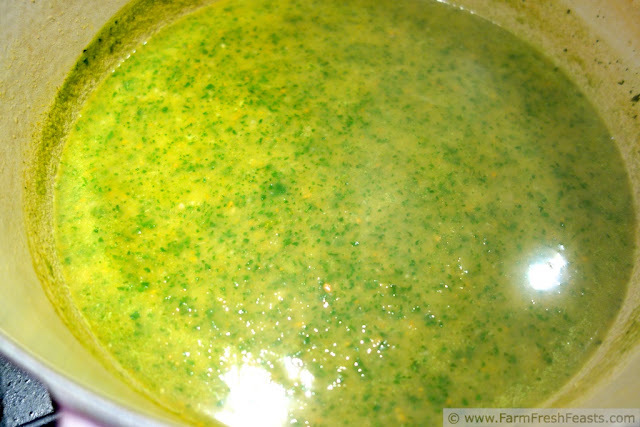 A simple healthy soup of fresh vegetables with plenty of greens, then pureed for smoothness. 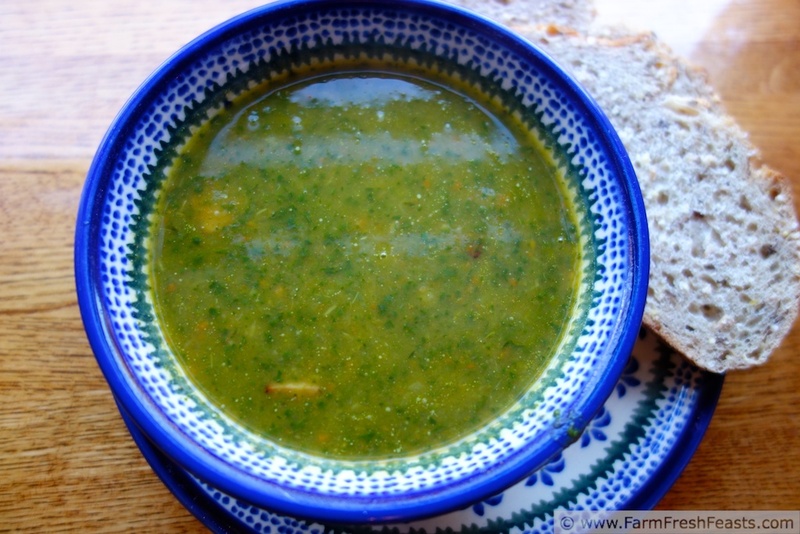 This soup is gluten and dairy free, and can be made vegan if you like. Whoa-the dishes are actually matching this time! Never happens here. After a month of indulging in my favorite holiday treats, and making my traditional holiday meals, and going out to holiday gatherings, I crave something simple like soup. Soup that doesn't have lots of cream, that's just made with wholesome ingredients, soup that is going to help me reach my goals of eating more vegetables. I have a terrible problem of reading recipes but not following them precisely. 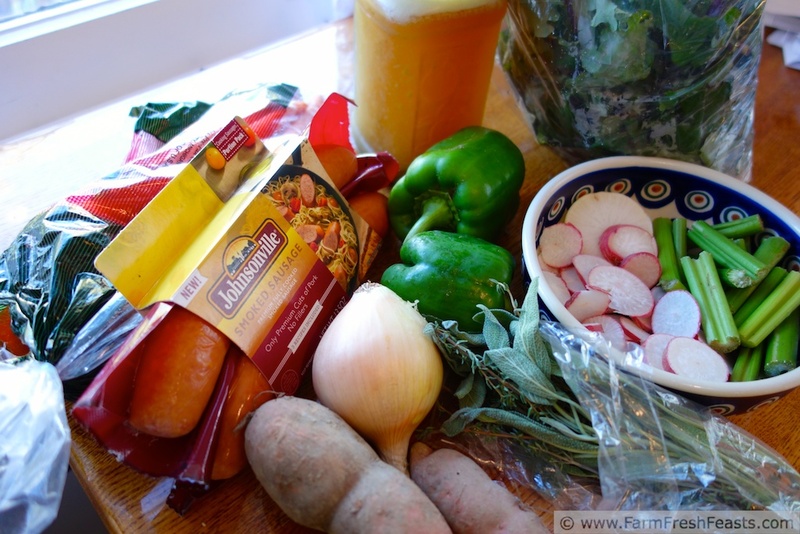 I'll get an idea of something I want to make, or I've got stuff from the farm share I need to figure out how to use, so off I go in search of recipes. I'll look in my cook book stash, my bookmarked recipe files, and surf the internet. Usually I will find 2 or 3 different ones that look appealing, then cobble together my own creation. Generally, the result tastes pretty good. I have not yet mastered the technique of making soup without a recipe. Sure, I know how to use good ingredients. I know to sauté the veggies to get some caramelization at the start. I know soup is better the next day. But the seasonings/spices/salting--especially the salt--trips me up. I'm so afraid of over-salting that my family has gotten used to adding a few grinds from the salt grinder at the table. This soup is like the Pirate Code: more of a guideline, really. The next time I've got a pile of leftover vegetables, and kale, I'll make it in a slightly different way. Still good, enjoyed with a good bread and a hunk of cheese. What isn't good, enjoyed with a good bread and a hunk of cheese? I could eat that morning, noon, and night. A simple healthy soup of fresh vegetables with plenty of greens then pureed for smoothness. This is gluten and dairy free, and can be made vegan if you like. Heat a turn of oil over medium in your pretty purple pot. Or whatever large (5+ quart) heavy bottomed pot you use for soup. 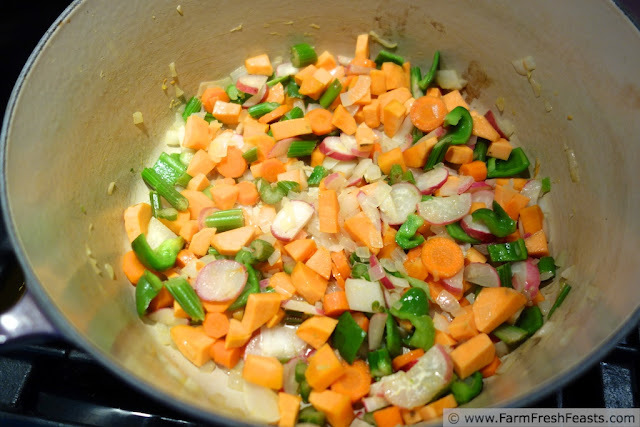 As you prep the veggies, drop them into the pot to start sautéing. It doesn't much matter if they are not all uniform in size, between the simmering and the immersion blender it will all turn out fine. When all of the chopped veggies are combined with the hot oil, sauté for 10-15 minutes until the onions are soft and the rest have started to soften. Add the liquids and thyme, bring barely to a gentle boil, then reduce heat to medium-low and partially cover. Simmer for 30 minutes, up to an hour, stirring occasionally. Add the massive amount of kale, stir to combine. Simmer 10 more minutes or until kale is wilted. Puree with an immersion blender (or carefully in small batches in a blender). Or leave it all chunky if your family isn't picky like mine. Add salt and pepper, because you will need some. Start with a teaspoon of salt and 1/2 teaspoon of pepper and go from there. My family likes this with chunks of smoked sausage in it, so while the soup is simmering I fry up a pan of smoked sausages and add them to each bowl as a garnish. For more recipes using massive amounts of kale, please see my Kale Recipes Collection. It's part of the Visual Recipe Index by Ingredient, a resource for folks like me eating from the farm share, the farmer's market, the garden, the neighbor's garden, and great deals on ugly produce at the grocery store. Your turn--what do you always need a recipe to make? How do you figure out how much salt and pepper to add to soup? This looks delicious! I went to a cooking class a while ago and I was shocked by how much salt the teacher put in everything. But then I realized that lots of things taste better with a good amount of salt, so I've been less afraid to overdo it lately. I think cooking classes are great, because you can see how much salt is used. It's one thing to read about it, but to see it in action means more to me. I suppose I'm a visual learner. I hope to branch out and try a bit more. I always put a ton of salt in soup but then again, I love salty. I generally add salt and pepper while the onions and veggies are sauteeing and then I add some more when I add the liquid. I love soup this time of year, and anything with a hunk of bread and cheese is a winner in my book. Maybe throw in a book, a warm fire and you've got yourself the perfect evening. The perfect evening provided you've typed up all the recipes you made the end of November . . . Soon I can say I'll start the new year with a clean slate/no back log. It's only the 4th, right? That's a good idea to add during sautéing, I will try that. Perfect recipe to use in a Vitamix! Get one at www.vitamixreviews.com!